Over the last year in particular, Ask Ubuntu has made a great deal of advancements regarding its standing in the wider Ubuntu community. 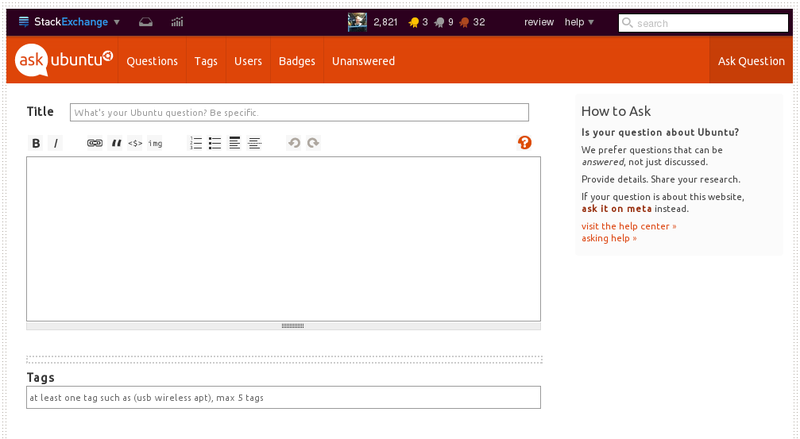 The prominent integration in the new Canonical topbar, as well as help texts and install slides telling users about Ask Ubuntu gives us the unique position of being the source of information for people with problems with Ubuntu. This, however, causes some unexpected issues: A lot of the questions asked nowadays are purely tech support questions - people dump a crash log or error message on us, give us little information about what they are even trying to do, and then expect us to find a solution for them. Mostly, these users don't stay or come back either, and just want their "question" answered. This, of course, hurts the site: We get a lot of low quality questions, and due to some of our shortcomings with closures, these questions stick around despite being utterly useless for us. We need to get rid of this tech support impression. We're not tech support. We're here to help solve problems on a working Ubuntu, not fix a broken one. We're here to answer questions about how to use Ubuntu, not how to debug it. Tech support inherently requires an awful lot of data, and an awful lot of interaction with other people. This does not mix well with the Stack Exchange format. We cannot have a handful of requests for more information in the comments section of every other question, and we cannot wait for these to be added at the asker's leisure and leave the question to rot in the depths of Unanswered in the meantime. For tech support related to bugs, people are far better off on launchpad, and troubleshooting may be better served in a dedicated chat, on an Ubuntu IRC or even the Ubuntu Forums. I see the arguments and I agree that some things are better off done in other places (hence our various closure policies) but we are tech support and we're not the only ones. Almost every Stack Exchange site handles the stuff you hate in some form or another... We all also handle better more interesting stuff too. I've made my thoughts on how we filter out the crappier aspects. With technology I think we can handle duplicates and poor quality questions before they end up on the site. We can filter people onto the right site before they post. I started a drive toward something like this in a Wizard but it's serious work that needs time I haven't had. I hope that's understandable. A lot of the questions asked nowadays are purely tech support questions - people dump a crash log or error message on us, give us little information about what they are even trying to do, and then expect us to find a solution for them. Mostly, these users don't stay or come back either, and just want their "question" answered. This, of course, hurts the site: We get a lot of low quality questions, and due to some of our shortcomings with closures, these questions stick around despite being utterly useless for us. Let's make changes to what people see when they actually go in intending to ask a cruddy "question". We won't get anywhere unless we try to communicate information to our valued custom - AHEM the site visitors who want to ask a question. Here's something that could be a huge part of the issue - This is all you see when you go to ask a "question". It is located on the right side of the interface. Anyone in advertising knows that ads on the left side of the screen should always cost more than ads on the right side of the screen, because it has been proven that the human brain works in such a way that, when a person uses their brain to understand a website, it pays sooner and greater attention to the items and ads on the left (source: American Psychological Association). It has been theorized that this is because most people are trained to read from left to right. The same thing applies here because we are trying to communicate with people. So when people are going to ask a new question, they aren't thinking "Wait, I better read this thing about how to ask first...", they are thinking "TITLE! Let's get it started!" So maybe the box should be moved to the left. But even then, most people seeking "tech support" will want to breeze past it and not pay much attention, opting instead to focus on their question which is of course the most important thing in the world and trumps any sort of reasonable guideline. We need to have the information in the box spread out across the page in noticeable places. When an asker clicks on the three page elements they are certain to click on (namely the "Title" box, Tag box, and question body editor) there should be some sort of informational, Yahoo! Answers-style box indicating these expectations outlined in the box (like indication of research). This kind of notification should verge on annoying, but the point is we need something to be click-activated and, if possible, moving, to let the asker know what the question expectations are. The "asking help >>" link is nearly unnoticeable. The font size should be increased for this and the other things in the box. The actual content of the box needs to be improved (see below). We should be urging askers to put important information in their questions, not treating them as if they are slow in thinking and taking an unintrusive, non-specific tone. Moving on. 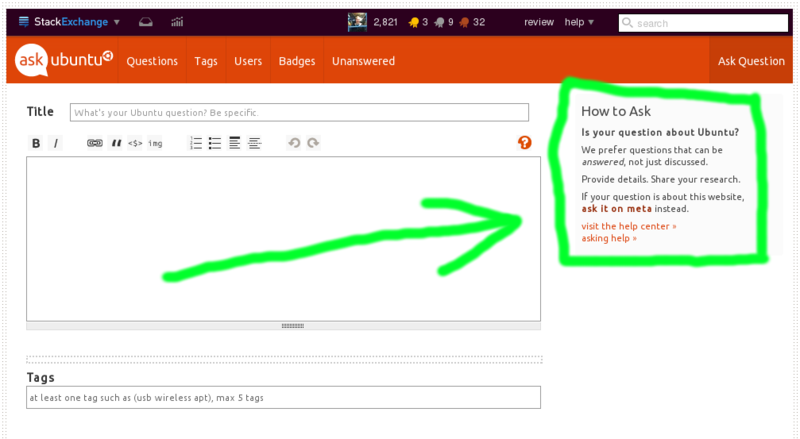 The grey text reading "What's your Ubuntu Question? Be specific." needs to change. It's kind of useless and longish to read, and "Be specific" can mean many things to many different people ("Specifically how angry I am?"). Also, "What's your Ubuntu question?" is redundant. We should change it to something that would actually get the asker to pay attention to some guidelines, yet retain the polite tone: "The more specific, the better. ", for example. I'm sure there would be better examples, but what we have now could be improved. We should have some grey text in the question editing box; it seems awfully blank and having some there would help improve and at least get people to think before they type. This would work best as a list of blurbs. For example: " _ Help us help you - provide as much detail as possible. _ Do a thorough search before posting - your question is likely answered somewhere else. _ Make sure to provide lots of technical details in your hardware-related question. _ Use proper formatting for code and quotes, grammar and punctuation; neatness counts!" This text would, of course, disappear once the box is clicked. The "Tags" box grey text could also be refocused so people really think about the tags they put in. "Use tags as specifically as possible. (Max 5 tags)" or "For best results, use detailed tags. (Max 5 tags)". Those are some things that we can easily do to improve the interface and gear it towards what we need to communicate to new askers. The way I see it, we won't get anywhere at all unless we actually look at the source of the problem and make decisions now about fixing it. What do new users know about asking questions? Practically nothing. It is our responsibility to take care of that, inform them, and not complain about a problem that we really can and should solve on our own. Make a wizard everyone has to go through before they ask a new question, as was attempted last year (can't find it now). Links to meta questions (in a noticeable place) about what exact details should be added in to hardware questions. Improving the AU search engine to provide better dupe results and overall search results. The main issue here is that we need to communicate to the site visitors more clearly, using tried and true methods by other websites such as Yahoo! Answers and other SE sites. Right now, SE in general is too easygoing and non-intrusive in their user communication philosophy for a site like AU. Rethinking these in the ways mentioned above would make a difference. The full version of my answer is here, I'm not going to repeat myself, and I also read your other post. Linux mint forums got tired of "debugging questions" too, you could go there and have a look, Elementary OS moderators got tired too, and guess what? Both forums died. You know why? Because all Ubuntu based distros are known as "the beginner distros"
Zorine, mint, Ubuntu, Elementary, you name it, and if you don't believe me, go to youtube, and type "zorine distro review" or any ubuntu distro, watch any video, the guy who's doing the review, will give you a big smile and say "If you're a beginner, I definitely recommend this distro, they have a great community, you will never be left in the dark!" Who's to blame? no one. So you think, I like Ubuntu? No way! I like Crunchbang and Manjaro, installed Ubuntu, because I wanted to make sure, that if I get an error (and I do get many errors), there's someone to help me. Now you say, that I should debug my problems? Debugging would require me to read all the basic linux command, and understand what modules are loaded and how my system works. Well, in that case I go for Arch or Manjaro, get a bleeding edge distro, not having to worry about updating my system, and at least I get to show off on IRC on how I customized my OpenBox or written my own window manager. If Ubuntu loses its tech support, it looses everything. This why people would go for Opensuse, this why people prefer Red Hat over Centos: Tech Support. About your second question, duplicates, low quality questions and stuff: this is why I'm considering to leave AskUbuntu, I left many forums and Q&A sites because of that, and I might leave this site as well. Maybe I will only ask, but it's really boring to answer some questions and to flag and so on. God bless the mods, they are doing a good job in this environment. If you guys think this is a problem *tell noobs * when they join cause that's the basic impression I got when I joined but if that impression was wrong, tell us noobs when we first join. Why not force the reading of the how to ask page for new questioners on the site? (Not Rep based but visit based) Say new user, (last seen never) goes to ask a question clicks on the ask a question link gets routed to the how to ask page which must be read in order to continue to the question box. We could take the same approach for a first time answerer (previous answers 0) and the how to answer page. I believe there are a great many users who clearly don't know how the site works and treat it like a forum. I'm sure all of us have seen questions and answers that exemplify this. It's my contention that enforcing a minimal education through a forced timely display of these pages would be useful. I know that in the short time I have been here I have been corrected many times and made at least my share of mistakes, but at least I actually read those pages. Had I not I'm certain my results would have been "Meh, not so good"